This paper draws from the experience and observations of a range of practitioners from the academy, the consulting community, State Historic Preservation Offices, National Park Service and a representative from an indigenous community. I want particularly thank Robert Z. Melnick, Nora J. Mitchell and A. Elizabeth Watson who shared their perspectives and recommendations on the future of cultural landscapes in the context of larger effort to take conservation to the landscape scale. A version of this paper was presented at the Network for Landscape Conservation’s workshop held in the Fall 0f 2017 at Shepherdstown WV. This paper is reprinted with their support. There is a growing recognition that cultural resources should be viewed as part of the larger landscape. The concept that there is a unity of nature and culture has created a significant opportunity for cultural resource practitioners to contribute to the new field of landscape scale conservation. And there are compelling reasons to partner up with this emerging movement. The nature conservation field has long recognized that threats to natural resources occur at multiple and much larger spatial scales than those usually addressed in cultural resource preservation. Ecosystems are adversely affected by impacts that transcend political and disciplinary boundaries. Threats include urban expansion, air and water pollution, deforestation, agriculture intensification, mineral extraction, and of course climate change. The nation’s cultural heritage faces the same threats. Responding with a landscape or regional approach is a better match to the scope of the problem. It can also be argued that adding a cultural dimension to large landscapes enriches the heritage value of a place and engages residents and visitors in stewardship efforts. The question remains: how can we make this partnership work? The growth of technology, of what is called big data, has fueled the development of the natural conservation at a landscape scale. And as stated above there are good reasons for the field of cultural resources to jump onboard. To do so the first steps are to identify, understand and prioritize what cultural resources should be considered for conservation and to better understand the relationship of cultural heritage to natural systems. However, recent consultation with leading practitioners exposed some serious fault lines in this part of the process. Traditional historic preservation practitioners used the definition of significance derived from the National Historic Preservation Act, while indigenous communities and other local communities take a more holistic approach that includes intangible values. Conservation groups often use community-based indicators – recreation, educational facilities, and so on. Each of these perspectives is valid, but none is sufficient unto itself. This is part of the challenge. As large landscape work increasingly depends on the power of mapping and big data for setting conservation priorities, decisions on what is mapped really matters. The nature conservation community has identified this as a barrier to working with cultural resource partners. And unfortunately, they are correct; there is no consensus in the cultural resource community in how to present this information. The National Register of Historic Places is limited– Although widely used, this data set is seen as an imperfect tool to identify the cultural resources present in a landscape. In many states the data base of cultural resources is incomplete and inadequately evaluated. One land conservancy in Maine, disappointed in the limited National Register listings in their region, went so far as to develop a crowd sourced tool to find more historic resources in the region. Required cultural surveys for environmental review purposes often only identify properties that might be eligiblefor the National Register. For this reason, unless owners are seeking federal rehabilitation tax credits, there is little incentive to proceed to the expense of listing a property. Moreover, the limited number of National Register sites is the just the tip of the iceberg. Other local and state historic inventories that should be the first place to consult are inadequate, incomplete and most challenging inaccessible. Funds to redress these problems are in chronically short supply. Moreover, few states have invested in state-of-the-art computerized digital access to their data. Other states are so behind this curve it will take years to catch up. What National Register data there is very particularistic – building by building or site by site – there are very few designated cultural landscapes. While landscapes as a property type can be identified using the program’s criteria, this category has seen very limited application. State historic preservation officials who administer the National Register program in partnership with the National Park Service have been wary about designating landscapes, often concerned about the level of effort and about the potential for political push-back. New Blended Data Sets– Without a commonly accepted data set for cultural resources, there have been some innovative new directions to fill the gap, such as crowdsourced data bases mentioned above. A leader in the field was the Landscape Conservation Cooperatives (LCC), a Department of Interior initiative charged with regional landscape-scale planning that integrates cultural and natural resources. The Appalachian LCC began pilot projects to tackle this integrated approach. The project identified 11 cultural resources data sets including such tangible factors as recreation, agriculture, economics, learning, water, and wilderness as well as cultural heritage, plus such intangible information as aesthetic, visual, sense of place, etc. Work is underway to develop these data sets and metrics in the Commonwealth of Pennsylvania with the goal to expand into other states. While this is an example of a more expansive approach to gathering cultural and social data than traditional historic preservation techniques, the future of the LCCs and hence this initiative’s future is very uncertain. At this time there is no generally accepted model that integrates cultural and natural heritage and allows cross-region comparisons. Better definition of Cultural Landscapes– More aid from the National Park Service in identifying and designating cultural landscapes was a uniform recommendation from practioners in the field. The agency offers guidance on identifying landscapes such as Guidelines for Documenting and Identifying Traditional Cultural Properties(Bulletin 38) and Guidelines for Documenting and Evaluating Rural Historic Districts(Bulletin 30), but much more support and training is needed. Fortunately, the National Park Service has initiated a study of the nomination of cultural landscapes to the National Register of Historic Places as part of a new initiative to develop improved guidance for the program. More effective use of other large landscapes designations– National Heritage Areas were mentioned numerous times by commentators as a promising approach that takes a holistic approach to the landscape. Long distance trails could work as well. 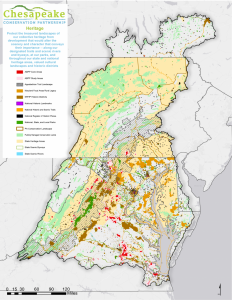 For example, the Appalachian Trail Conservancy has a new large landscape initiative to recognize and preserve not just the treadway, but the lands beyond the trail. The Captain John Smith Chesapeake Bay Trail, for example, has identified a much larger viewshed. Scenic byways, scenic rivers, and long-distance greenways also offer possibilities. Expand the application of the Indigenous Cultural Landscapes– This concept was developed to better understand cultural landscapes that demonstrate aspects of natural and cultural resources that supported Native American lifeways and settlements in the early 17th century in the Chesapeake Watershed.This approach demonstrates that significant places important to Native American are not confined to the sites of houses, towns, or settlements, and that their view of one’s homeland is a holistic landscape approach. Other conservation initiatives– There is a real need for a dialogue about terms and definitions with the natural resource community, land conservancies, and the others. This is particularly true as cultural assessments move into the realm of social science. Work with SHPOs to help them advocate for a nationwide initiative in investing and reinvesting in surveying and records management that supports these new approaches and readily available, digital public access. Of course, identifying resources in the landscape is only the first step. Practitioners offered a number of different strategies to conserve cultural landscapes. In most cases the techniques to conserve cultural landscapes are not very different from those used to conserve land for natural resource values – and natural and cultural heritage are often interlinked. A number of experts noted the importance of public engagement not just in assessing what is significant, but also in understanding how it will be conserved to benefit the community and future generations. Additional Funding – Finding funds for conservation planning and of course for actually saving landscape resources is a challenge for all parties in the conservation movement. However, cultural resources feel a greater pinch, as there are not as many funding streams dedicated to conserving lands that contain cultural resources. Partnerships are essential– Over and over the value of saving landscapes with multiple values has been emphasized by the large landscape movement. This can bring more money to the table and more shoulders to the wheel. Partnerships to protect battlefields and conserve recreational assets were specifically mentioned. It is important to encourage land trusts and other partners to protect cultural as well as natural lands. Coordinate with State Agricultural Conservation programs– One area that stands out as a conservation success are programs to preserve agricultural landscapes. While only a few states like Minnesota and Pennsylvania have both developed agriculture historic context studies and programs to preserve farmland, there is an opportunity to adapt farmland preservation programs to honor and interpret this part of our nation’s heritage. One program that has potential is recognizing owners of Century Farms. Finally, it is important to seek out innovative examples that have stood the test of time. The Oley Valley Rural Historic District in Pennsylvania has shown how land conservation, environmental protection and historic preservation have been coordinated to achieve effective conservation. Engage with landscape scale efforts – And of course joining the Network for Landscape Conservation and highlighting initiatives across the nation that incorporate both cultural and natural values. Cultural resource and conservation practitioners have varying perspectives on how to incorporate cultural values on a large scale, and what should be the defining criteria. However, the good news is that there are positive signs that the conservation initiatives are working in some new partnerships that connect cultural and natural heritage. 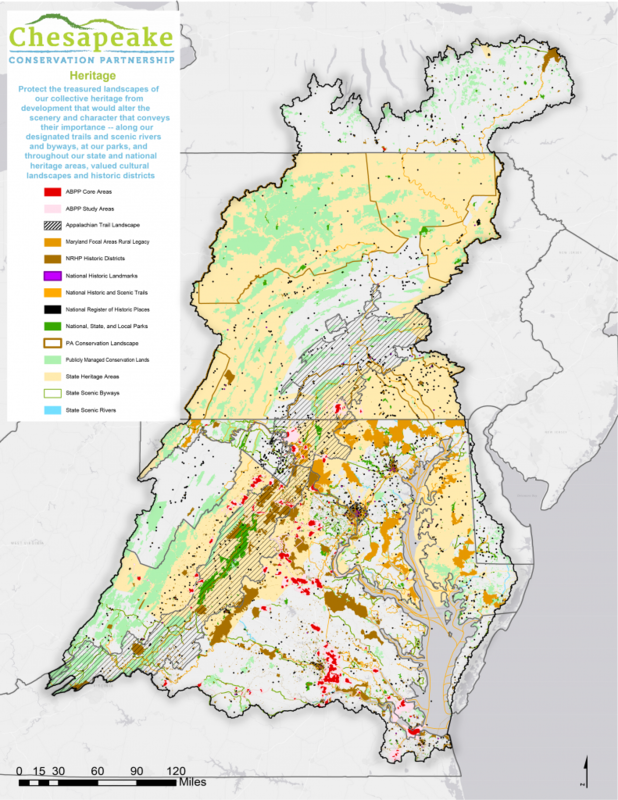 Projects from the Chesapeake Watershed to the Crown of the Continent are awakening to the need to include a cultural or human dimension in landscape conservation planning. Underlying this new positive thinking, there are some serious challenges. One cultural landscape scholar noted that parts of the historic preservation community are still mired in the nature/culture split. Going forward, it is critical that the preservation community get past the categorization of resources that denies the applicability of ’natural’ resource scholarship and tools to cultural resources, especially cultural landscapes. Another barrier is the set of traditional preservation criteria for determining ‘integrity’ of cultural resources, one that does not recognize the larger dynamic environmental context, especially in this era of climate change. To conserve resources on a landscape scale, practitioners need to think one size larger and engage in a broader level of flexibility. Today this discussion can best be characterized as a “Work in Progress”.